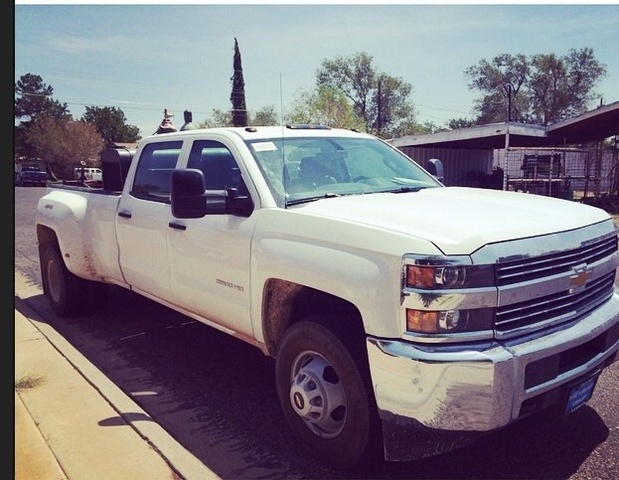 Looking for a Used Silverado 3500HD in your area? CarGurus has 13,952 nationwide Silverado 3500HD listings starting at $5,900. 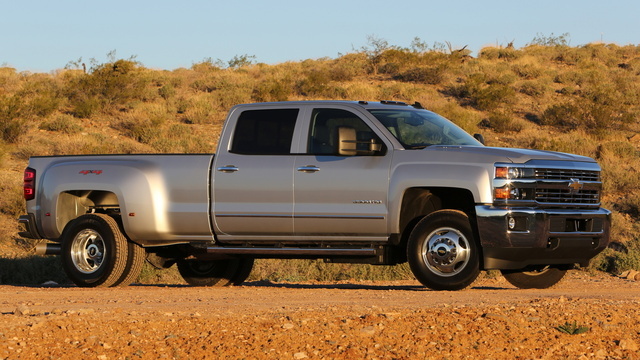 Redesigned inside and out, Chevrolet’s 2015 Silverado 3500HD heavy-duty, full-size one-ton pickup will be coming to a construction site near you early in 2014. The unmistakable chiseled profile has been even further squared off for this latest version, while the cabin is quieter and more comfy, featuring added sound insulation and redesigned seats. Also new this year, a few extra pieces of standard and optional bling are added in, and now a new Double Cab trim with forward-opening rear doors returns in place of the long-defunct Extended Cab. Thus, for 2015, this big rig is offered in the 3-passenger Regular Cab, the 6-seat Double Cab and the roomier 6-place Crew Cab. Trim levels, meantime, should stand pat to include the base and basic Work Truck (WT), the midlevel LT and the top-shelf LTZ; the latter available only in Double Cab or Crew Cab configurations. Of course, bed lengths remain the 8-foot long bed or the 6-foot, 6-inch standard bed, with Regular Cab trims delivered only in long-bed garb. Some new features added to the 2015 Silverado 3500HD lineup include a standard 4.2-inch infotainment and driver-information display, as well as an 8-inch touchscreen infotainment display that’s standard in the LTZ and available to the WT and LT. GM’s touted MyLink apps for smartphones has also been upgraded for this latest heavy-hauler iteration, while larger buttons and knobs on the instrument panel are more work-glove friendly. Additionally, high-strength cargo hooks and an available safety package are also brand new for 2015 variants. Alas, powertrains remain static for the new-look Silverado 3500HD, meaning the standard 6.0-liter Flex Fuel (FFV) V8 returns with its 322 hp and 380 lb-ft of torque and remains managed by the 6-speed shiftable automatic transmission of yore. Towing numbers remain maxed out at 14,500 pounds with the proper equipment, while mileage figures should remain at last year’s 11 mpg city/16 highway. Should considerably more oomph be needed, the potent 6.6-liter turbodiesel V8 returns as an optional powerplant lineup-wide, with the well-wrought Allison 1000 6-speed auto-manual transmission riding heard on 397 hp and 765 lb-ft of torque. Towing is maxed out at a respectable 19,600 pounds with the standard factory hook, while fifth-wheel capacity is some 23,000 pounds. Once more, all 2015 Silverado 3500HD trims come with standard rear-wheel drive (RWD). But fear not, all can be delivered with part-time 4-wheel drive (4WD) that boasts a 2-speed transfer case, auto-locking hubs and a locking rear differential. Again, depending on the trim selected, you can get this capable rig with dual rear wheels (DRW), while tweaks to the standard trailer sway control and exhaust braking systems as well as an upgraded tow hitch mean trailering your way across the country just got a little easier. Depending on the trim level selected, this heavy-duty workaholic is slated for such standard appearance features as 17- or 18-inch wheels and a trailer hitch and wiring, with the LT boasting standard power-adjustable outside mirrors and the LTZ flaunting a power sliding rear window and GM’s ballyhooed EZ-Lift tailgate. Inside, look for cloth or leather-trimmed upholstery, with the LTZ hefting heated power-adjustable front seats with memory for driver's settings. All trims should once more sport standard cruise control, tilt-wheel steering and power accessories, with the top-shelf LTZ additionally featuring a rear-view camera, remote garage door opener and remote engine start, all standard. Again, depending on the trim level, either manual air conditioning or dual-zone auto climate control returns, as do Bluetooth-integrated OnStar Directions and Connections technology and a single-CD player with 4 (Regular Cab) or 6 (Double Cab and Crew Cab) speakers. Satellite radio is delivered in the higher trims, as are a memory-card slot and, in the LTZ, those upgraded MyLink smartphone apps. Optional items, again depending on the trim level, include upgraded and upsized wheels, tubular sidesteps and a spray-in bed liner. Beefed-up axle ratios and an integrated trailer brake controller are also available, as is a 7-speaker Bose premium audio system and, in the LT and LTZ, a hard-drive-based navigation package. Added to last years plethora of safety features in the 2015 Silverado 3500HD LTZ is an available Driver Alert Package. This optional package adds a safety alert driver’s seat warning system, lane-departure alerts and a forward-collision alert to the usual 4-wheel antilock brakes (ABS), traction and stability control, and the 7 airbags that are standard lineup-wide. Additionally, all trims sport daytime running lights, with higher trim levels boasting standard OnStar emergency assistance and communications that are optional in the WT, with a theft-deterrent system that’s also available to the WT and LT remaining standard in the flagship LTZ. Finally, StabiliTrak stability control is now standard in all 2015 trims packing DRW. What's your take on the 2015 Chevrolet Silverado 3500HD? Have you driven a 2015 Chevrolet Silverado 3500HD? No power to the left signal light wire on the 2015 chev Silverado ,lights on front and mirror works is there a problem with body control module.